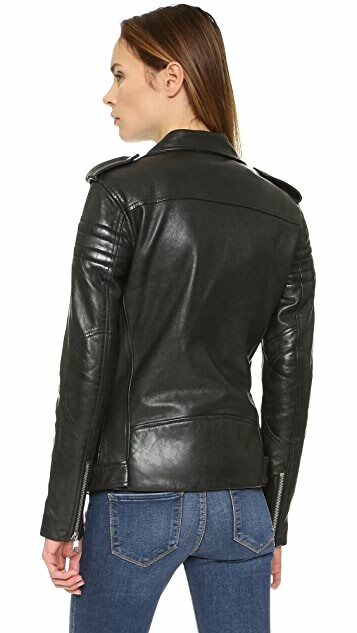 A soft and sturdy moto jacket looks classic and cool with exposed zips on the pockets, cuffs, and off-center placket. Quilted sleeves and a belted waist offer functional style. Lined. BLK DNM's nonconformist attitude is largely inspired by creator Johan Lindeberg. A luminary of the denim industry, Lindeberg was a creative force at Diesel during the 90s. He founded his eponymous brand, J. Lindeberg, in 1996 and remained as Creative Director until 2007. Before launching BLK DNM, Lindeberg supported Justin Timberlake on the development of his iconic denim brand. Blending NYC edge and Stockholm cool, BLK DNM bucks the industry and delivers pieces that are instant wardrobe favorites. The cut of this jacket is really too boxy. I ordered a size M and the arms were way too tight, shoulders slightly restricted but the rest of the jacket was fine. I do like the longer length though. I swapped for a size L but it was like 2 sizes too big. The quilting is too bulky and makes me look like I have man-shoulders. As I am an international customer also, the process of switching the sizes was a little convoluted. It's been a slightly disappointing experience. I am 6'3" and this jacket fits perfectly. I bought a medium and a large and kept the medium. The sleeves are long, the body narrow and the shoulders just right. I might get the belt secured to the jacket itself half way back on both sides so it doesn't sag so much, but other than that it's absolutely fabulous. I would not recommend for anyone short. It is a lot of jacket. Firstly, the cut isn't right. The arms were way too tight and rest was fine. I liked the longer length. The quilting on the top of the arm made me look so bulky and was not flattering at all. Overall this biker jacket was probably a bit literal for me. I would have taken the tabs off the shoulder and de-speced a little, but that's just personal taste. Returned it. I tried the XS but it was just too much leather for my small frame. I am 5'3", 110 lbs & it was just too much for my small frame & little features. 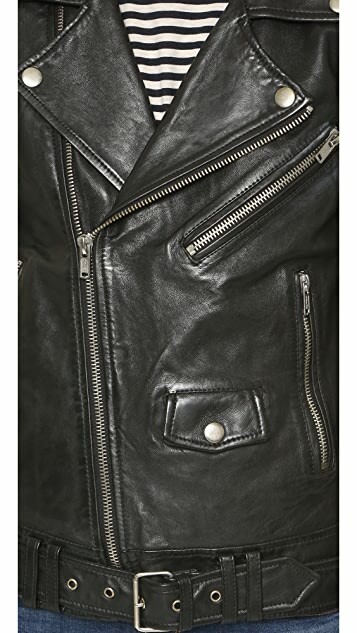 The quality is exceptional; indestructible is how I would describe this jacket.It is thick leather & very heavy. Not a jacket you want to carry around. 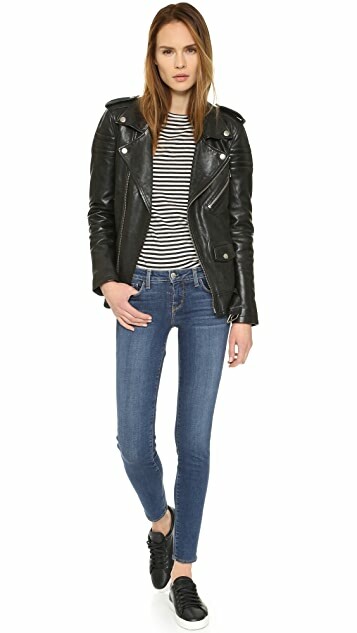 This jacket is for a girl who is confident in wearing a very tough moto-style. It makes a statement. It is a lifetime keeper. It ran a bit bit on me. 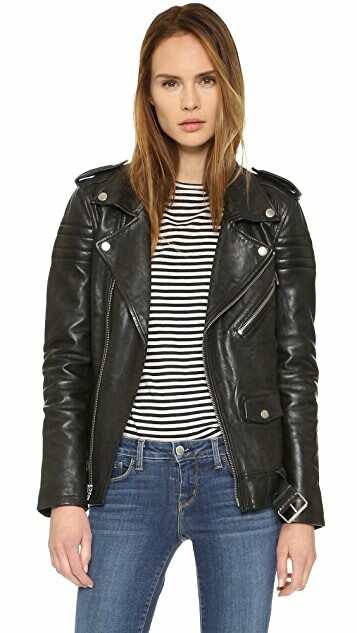 I suggest that if you are short to find a different jacket; this one is for a bigger/taller girl. I purchased this jacket with the intention of it being an outfit maker - something I could drape over my shoulders, wear inside, etc. It's VERY substantial and stiff. It's starting to loosen up and I don't mind having a new outerwear/fall jacket but it's definitely on the larger side. The sleeves are long, too. Nice jacket but not "the one"
NIcely made leather jacket. Heavy leather and good lining. The sleeves fit nicely, and ordering at your normal size you should be able to fit a thick sweater underneath, especially if you don't zip up (and I think it looks weird zipped up). Unfortunately I ended up returning because it just felt too long on me-I am 5'3" and it dwarfed me. I was worried I looked too much like an extra T-bird from Grease and that wasn't the look I was going for. I think this coat is made for people who want to hide their figure or for people who are extremely tall. I am 5'8", 36A, Waist 27-28, and the small was HUGE. It was not the flattering 'slightly oversized casual' look on the model. It looked like I had literally stolen the jacket from my boyfriend (and not in a good way). I did not try on the extra small, but can't imagine that the sizing would change enough that it would be flattering. Plus the reviews are true, arms are tight and only a thin sweater would fit underneath. Unfortunately, had to send it back. 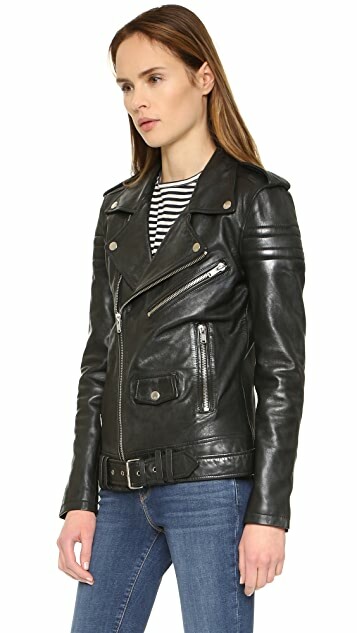 This jacket looks amazing and the leather is really good quality, however: I'm 5'4" and 125 lbs, and a size 2-4: I ordered a small and it completely swallowed my frame. It's not even an issue of size (although I could have probably sized down): the style is very bulky and masculine, and would probably look good on someone taller than me, but I had to return it. I've ordered the VEDA classic jacket instead and it fits like a glove.